Early in the aggressively mediocre British rom-com Love, Rosie, high school senior Alex (Sam Claflin) tells his best friend, Rosie (Lily Collins), to meet him at a café—he has exciting news. As it turns out, she, too, has news: She’s just learned that she’s pregnant, having slept with her prom date when Alex chose to attend with someone else. But Alex goes first, showing Rosie his acceptance letter from Harvard Medical School. He leaves in three days. Unable to handle this sudden pressure, Rosie decides not to tell Alex about the pregnancy, even though she plans to have the baby; instead, she lets him fly to America, ignorant of her secret desire to be with him. If she tells him, she reasons, he won’t go. She’ll ruin his life. Ignore, for a moment, the sub-sitcom idiocy of someone deciding to hide her decision to have a child—which she’ll be raising for the next 18 years—from her best friend and dream lover, ostensibly for his own good. (No big shock: He eventually finds out.) But three days?! He just now got accepted to Harvard and school starts next week? 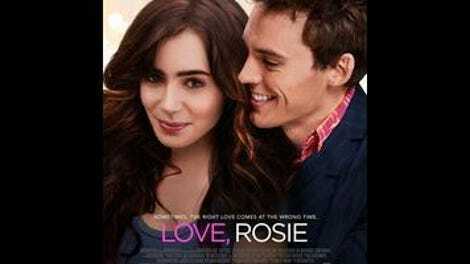 Maybe Where Rainbows End, the best-selling Irish novel from which Love, Rosie was adapted, explains that Alex was wait-listed and got an unlikely last-minute offer, but on-screen this plays like the first of numerous patently contrived obstacles to separate two people who were already pretending, for no apparent reason, that they don’t have the hots for each other. Every action both parties take, over roughly a dozen years, seems motivated by the understanding that there’ll be no movie unless they do it. So: Alex, not to be outdone, fails to mention to Rosie, when she goes to the States to visit him, that he and his blatantly unpleasant girlfriend (Tamsin Egerton) are expecting a child. Angry, Rosie winds up marrying the father of her own kid (Christian Cooke), a clod with great abs, when he suddenly reappears after having no part in their lives for five years. By the time this marriage is kaput, Alex is engaged to his own long-ago prom date, Bethany (Suki Waterhouse), having received no answer from Rosie to a letter he wrote professing his love, because Rosie’s now-ex-husband intercepted the missive and hid it from her. (This may seem improbable in a contemporary story, but it’s important that it be a handwritten letter locked in a drawer, not a deleted email, so that Rosie can find it later and be crushed.) And on and and on in this vein, with each new complication further tangled by both parties’ ludicrous insistence that they’ve always just been good, platonic friends, like Harry and Sally minus all of the wit and memorability. On the plus side, Collins (Mirror Mirror, The Blind Side) and Claflin (Finnick Odair in the Hunger Games franchise) are both appealing enough, even if their chemistry makes Rosie and Alex’s we’re-just-pals stance appear even more ludicrous than intended. And Jaime Winstone, daughter of Ray, has a welcome, spiky presence in the role of Rosie’s perpetually incredulous best friend. Whenever the actors manage to build up a head of steam, however, director Christian Ditter steamrolls over them with dopey symbolism (“EXPECT DELAYS,” reads a motorway sign when Rosie talks about following her dreams) and painfully obvious needle drops. Rosie’s giving birth? “Push It,” Salt-N-Pepa. Alex and Rosie had a big fight? “Alone Again (Naturally),” Gilbert O’Sullivan. Alex is writing Rosie a letter, confessin’ that he loves her? “I’m Confessin’ (That I Love You),” Peggy Lee. You really have to work to hack it up that hard.